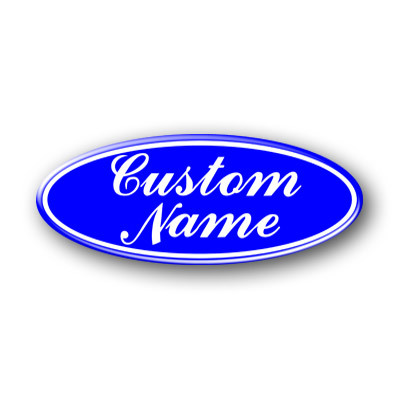 This is a Single Oval luxury aftermarket custom made 3D Domed Gel blue and white Ford Oval Custom Name Bonnet / Boot Badge. We have received a request from FORD not to use any of the FORD logos with immediate effect and therefore unable to do so. Please do not ask for a custom design if it is any of the FORD logos, WE WILL REFUSE. 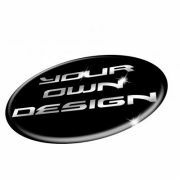 There will be a small cancelation charge if you place an order without making contact re your design, requesting a trademark design, use a custom file name not authorised by ourselves, use non standard characters or fail to provide a usable image. The oval size you select from the dropdown selection will be the size made and shipped. If you require another size please make contact so that we can add that size. You will receive the size selected. Domed stickers decals/badges are covered with up to 4mm thick, transparent, polyurethane coating for a 3D look. They are flexible, scratch resistant and flat on the back but can be applied to slightly curved surfaces, if curve is greater than 1mm-2mm depth from the center to the outer edge depending on the overall diameter depending on the overall diameter then additional adhesive may be required. Please note: these aftermarket 3D Domed Gels are custom made to order and are not a stock item, therefore not covered by the distance selling act. All our 3D Domed Gel products can take upto 5 working days to fully cure. We do have an advanced curing system that can cure these in as little as 24-48 hours but this is dependant on available space at the time of your order.